Doing some research to figure out the best zero turn riding mowers? We’ve done the work for you, and gone through a massive list of available mowers, narrowing it down to these top rated mower picks. This year’s list of best zero turn riding lawnmowers is dominated by two manufacturers—Ariens and Husqvarna. These outstanding machines are also joined by Toro and John Deere models to round out the best non commercial zero turn mowers, ranging in price from $2500 to $5000. Read on to see what we picked. Rated consistently high by hundreds of owners, the American-made Ariens Zoom 42” zero turn riding lawnmower features 7 cutting positions within its rust-resistant steel frame and three blades for optimal cutting conditions. The deck adjustment is controlled by a foot lever for on-the-fly control. Riders appreciate the fact that the blade protrudes a few inches past the wheel—combined with zero turn functionality, this allows for a closer cut around trees. Steering is touchy and may require a learning curve, but we feel this is true for most zero turn mowers, so be sure to start at lower speed. This model has anti-skid wheels that should assist in steering control. According to review, the powerful Kohler engine has no problem mowing up hills and mows large lawns in half the time as previously (up to 75% less time, according to some users), even in overgrown grass. Some reviewers claim the grass moisture bagger plugs up. The unit has comparable noise volume and ride comfort to other zero turn mowers. Note that although a strong performance contender for top 2013, this is a non commercial model selling for an affordable $2500. Therefore, the Zoom 42 does not include a visible fuel gauge (it is under the high-back adjustable seat), nor a mulching kit, which is an optional purchase. 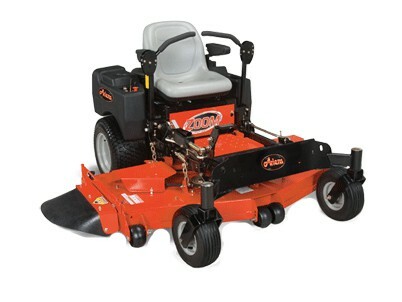 The second Ariens model to make the list is the Max Zoom 60 zero turn mower. The largest deck we reviewed, users boast about commercial-grade features in this model. 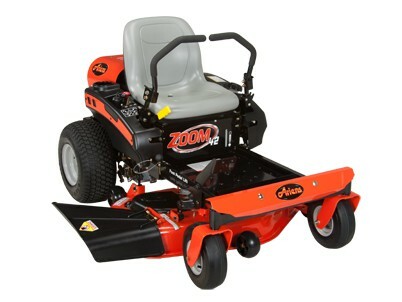 The Ariens Max Zoom provides a clean cut in a short amount of time with no missed lines. Wet grass will not bog down this powerful 25HP Kohler motor. According to one use, neither will five foot overgrown grass. However, several users noted burned grass during slow turns, so allow some time to get used to the zero turn steering on this unit, perhaps in the driveway. The 60” deck not only provides expanded cutting width, but also allows for a wide range of cutting depths from 1” to 5”. Some users had issues with leaking around the gasket seal and since the oil filter is located in an awkward position, this mower might be best suited for a DIY operator. Gas efficiency, however, is rated as excellent. Optional purchases include wheel covers, arm rest kit, FlexTend shoulder support system, engine guard, hex striper kit, and electric deck lift. These attachments will push the mower’s price well over its standalone $4850. We would love to add “comfortable ride” to the list of features, however an optional spring seat kit costing $260 is not the best way to achieve this, nor is lowering air pressure on front tires, according to some users. Husqvarna models have earned two places in this year’s list of best non commercial zero turn mowers. The first is the RZ5426 that sells for $3200 and is rated as a Best Pick by Popular Mechanics. A steel chassis offers a 54” deck with a spring-assisted life for easy height adjustment. The Kohler engine has 26HP and does not seem to get bogged down by wet grass, nor does it appear to be particularly gas efficient. Since the motor is in the back, users have the added comfort of not being blasted with motor heat while riding. In addition, the control panel is located on the right-sided panel, not the front dashboard, which provides righties with easy access to the ignition, choke, and throttle. The Husqvarna’s triple blades provide an excellent cut and the machine’s speed of up to 6.5mph cuts users’ mow time by an average of 40%. Cut heights range from 1.5” to 4” and are controlled by a 6-position lever. The deck also has Husqvarna’s Air Induction Mowing Technology for increased airflow and grass lift. Lowes.com indicates that the recommended terrain for this model is flat, and users agree. The rear wheels have been frequently noted to slip in wet grass or on inclines. Many reviews describe how operators are replacing factory tires with larger ones or deflating the tires under recommended psi to provide increased traction and a more comfortable ride. Other users believe the seat to be the culprit of their uncomfortable rides and order armrests and cushions to help. The second Husqvarna model is the RZ4623 zero turn riding mower. 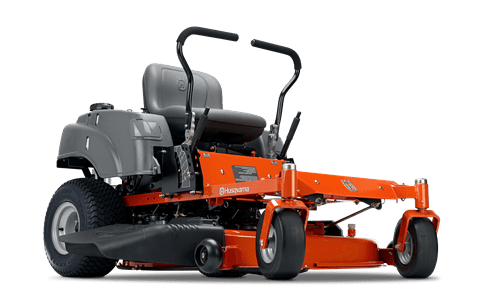 This model is $500 less than the previously reviewed model and shares common features with the RZ5426 such Air Induction Mowing Technology, side-mounted control panel, Hydro-Gear transmission, mower speed, ride stiffness/deck vibration, and cut height range. While rear tire traction control is still a problem, this unit seems to handle inclines better but still skids in wet grass. Here are the major differences. This model offers a 23HP V-Twin Kohler Engine and a smaller 46” deck. The RZ4623 only has dual blades instead of triple, and the blade-tip speed is slower. The RZ4623 also includes fewer standard features. A 2-bin bagger is sold separately, as is a mulching plug and blade. Despite the smaller deck and lower oil capacity, this model weighs considerably more than the RZ5426, possibly due to its thicker 13 gauge steel deck (the RZ5426 has a 12 gauge steel deck thickness). The weight likely contributes to this unit’s better traction control. Lastly, some users report problems with the exhaust being too close to the ground, so stopping for prolonged periods of time will burn the lawn. Given the features, operators are happy with both the operation and price point of this model. The RZ4623 consistently averages a 4.5 out of 5 star review. If in the market for a Husqvarna zero turn mower, consumers have the option of two top-rated units that appear to be durable, well built, and effective. 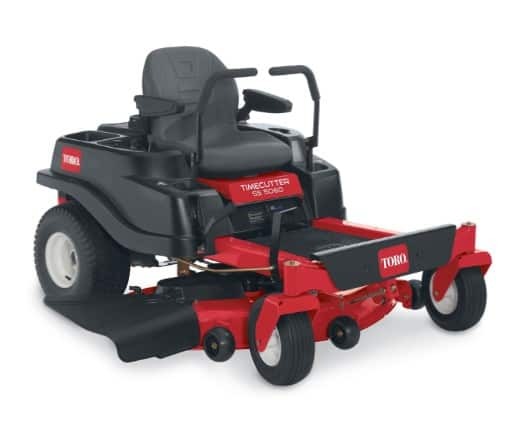 Another unit to be consistently rated at over 4.5 out of 5 stars is the Toro TimeCutter SS5060 zero turn riding mower. The triple blades provide a clean cut that can also be put to work with optional twin baggers and a 50” Recycler Mulch Kit. Toro’s quick 7mph mowing speed and large 50” deck will reduce mow time. Users report mowing in comfort—this model includes adjustable armrests, anti-vibration floor mat, and an 18” extra tall adjustable contoured seat. A quieter-than-average 23HP Kawasaki engine contains the right amount of power for the machine, according to reviews. This Toro offers features not found on other models. The Smart Speed Control System features a lever under the seat that allows the operator to choose a ground speed without changing the blades or engine speed. It also has a foot assist cut height system that lowers and raises the deck to avoid scalping and to change the cut height. Users dislike that there is no hour meter or gas gauge and only a 3 gallon gas tank on this $3500 model, but they did report good gas efficiency. Further, the rear tires are slightly undersized, causing unstable traction in wet grass and resulting in tires jamming in small dips or holes. Overall, we noticed that the Toro TimeCutter experienced fewer mechanical start-up bugs than did the Husqvarna models, something to keep in mind. 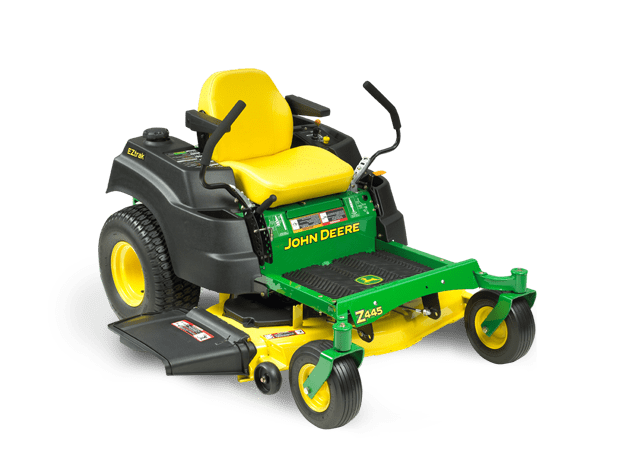 Our last zero turn riding mower pick is also the most expensive at $5000–the John Deere Z445. This is the fastest mower we reviewed, reaching forward speeds of up to 8.5mph, even faster than the Toro TimeCutter. According to users, it does this without skidding even in wet grass, a testament to tire traction control. The Z445 is the only model reviewed to feature a translucent 3.5 gallon fuel tank to allow the operator to see the fuel level (there is no other fuel gauge). Expect this pricy machine to have several standard features including an hour meter, mulching system, storage cover, 15-gallon mounted sprayer, and user-approved comfort features such as a storage compartment, cup holder, and spring suspension adjustable 17” medium-back seat. The Briggs & Stratton 27HP/724cc engine replaces the Kawasaki units of previous Z445 models. While most users prefer to have the Kawasaki, there have been few complaints so far about the durability and reliability of the Briggs & Stratton. The engine is powerful and has sufficient torque, but can be noisier than others due to the lack of a top engine cover. Users report that the deck washout does not clean well. Like other models, grass burning can be an issue if idling for over 30 seconds. The John Deere Z445 is expensive, but does include commercial-grade features and comes with an industry-leading 4 year warranty. We recommend it for those who have very large lawns. High ground speed will cut down on mowing time, and the time spent mowing will at least be comfortable. So what do you think? Do you own one of these mowers? Do you think we left out a mower that should be here? Leave a comment and tell others what you think! What’s up, I desire to know where you learned such awesome spamming skills. Please help.